Chayote squash,“sechium edule”, is a summer squash known by many names around the world, including vegetable pear, cho cho in Jamaica, Africa, and Brazil, christophine in France, pipinellia in Italy, and in Louisiana as merliton or mirliton. The chayote squash is grown predominantly in Mexico and Central America and you can eat it raw, boiled, sauteed, pickled and pureed. Chayote squash is low in calories -- one cup of cooked chayote squash has only 100 calories -- and rich in nutrients, making it a good addition to any healthy diet. The leaves, stems, fruits and roots of the chayote squash plant are edible and contain flavonoids. Flavonoids are antioxidants that protect the body against the cellular damage and inflammation caused by free radicals. Free radical oxidation, a natural process that occurs after eating, breathing, exercise and exposure to toxins, is reduced by antioxidants. Even when cooked, chayote squash flavonoids remain active and intact in the small intestine, where they are absorbed and used by the body to reduce inflammation. 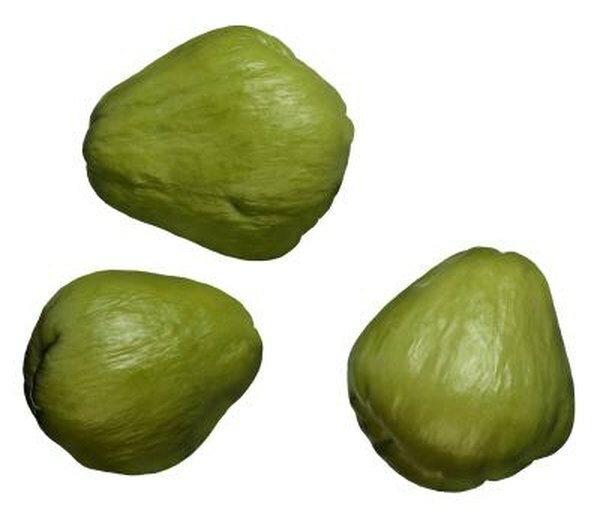 The insoluble fiber in chayote squash helps the passage of food through the digestive system and provides the bulk needed to promote regular bowel movements. Improving your dietary intake of fiber is a safer way to alleviate constipation than the use of stimulant laxatives. Each cup of raw chayote squash contains 1.2 grams of fiber and each cup of cooked chayote squash contains 2.5 grams of fiber. Although there is no recommended daily allowance of fiber, the American Diabetes Association suggests you get between 20 to 35 grams of fiber per day. Eating a variety of fruits and vegetables including chayote squash is a good way to get more vitamins for maintaining health and wellness. Chayote squash is a good source of several vitamins, including vitamin C. One cup of raw chayote squash contains 19.2 mg of vitamin C -- 26 percent of the recommended daily intake for women and 21 percent for men. This vitamin C proves essential to the production of collagen for the support and repair of tendons, ligaments, skin and muscle tissue. Chayote's mild flavor can add a nice touch to salad ingredients, or pickled and used in place of cucumber pickles or as a raw crunchy snack. Chayote squash has a smooth creamy texture when cooked and pureed. Chayote squash can also be added to soups and stews and used in place of summer squash in most recipes.